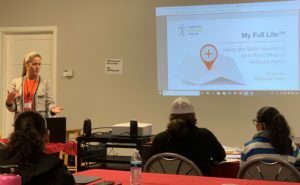 As temperatures dropped last month, two members of our staff escaped to California to work with our partners at Club 21 Learning and Resource Center, VTC Enterprises, and New Horizons. Community Life Coordinator Cynthia visited to conduct life skills software training through our My Full Life tool. A couple of weeks later, Chrissy visited to present at their Tools For the Journey conference. For the past twelve years, Cynthia Witherspoon has been working with the Full Life Model, developing tools and resources. She is an expert in our online application for life skills development, My Full Life, and shares these resources with our partners across the country. She visited Club 21 and VTC Enterprises to help them work with our My Full Life Skills Inventory over the course of six days. During her time in California, Cynthia met with several young adults with disabilities who will be using our Skills Inventory. On one day, Cynthia joined a young woman named Lily at a coffee shop. She then observed her grocery shopping and cooking delicious tacos. 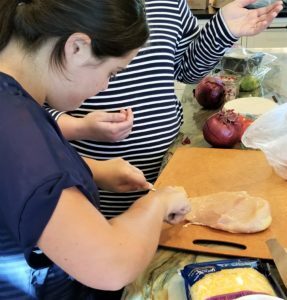 Throughout her trip, Cynthia says, “Parents of individuals completing a Skills Inventory had ‘ah ha’ moments.” The parents plan to encourage their children in pursuing more opportunities to practice independent living skills. Next, we will continue supporting the brand new Skills Inventory Consultants Cynthia helped train, completing written reports for the families. My Full Life Director Chrissy Dale also escaped to California during Chicagoland’s intense cold. Chrissy presented at the Tools For the Journey conference, hosted by Club 21. Using our Skills Inventory as a Road Map to Independence, Chrissy demonstrated how families can support the growth and development of their child. Want to learn more about what Cynthia and Chrissy were up to? Check out more information about My Full Life to learn about the Skills Inventory! You can also connect with Chrissy online or schedule time to talk about how My Full Life can help you.